"Tavan village is a very popular place in the Muong Hoa valley, located about 10 km from the town of Sapa. Officially, it is necessary to come here with a guide and a purchased ticket in price of about 2 USD. The ticket can be purchased in the centre of Sapa, in the tourist information center. However, this village can be accessed without a guide and without a ticket. It�s up to each of you what you prefer. Just go with some of the ethnic residents from the nearby villages by motorbike and just have a ticket. Or you can go with an ethnic girl �unofficial� way around the Ham Rong mountain and you do not have to buy any tickets. Around the mountain Ham Rong on the eastern part is very nice light trek, much better than going by road from the town of Sapa, �off beaten path"." We don't know much - about the origin of the minorities, who live close to the mountains. Some groups already lived in North Vietnam before the ancestors of the Vietnamese came to live here. The Vietnamese were originally from southern China over 4000 - 5000 years ago. At certain points different the Vietnamese inhabitants of the indigenous people who lived in the Red River Delta. They were the largest population group and lived in small villages and districts in Vietnam. Some ethnic groups kept living among the Vietnamese people. Others decided to maintain their independence and moved to the highlands, or were driven to the mountain areas. Where they still live. 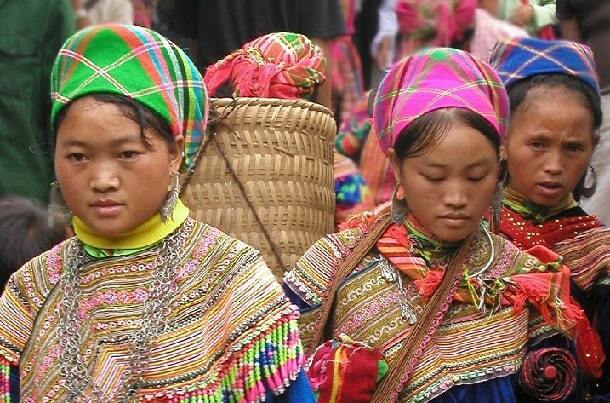 The Tay ethnic minority takes the 1st place in the ethnic minorities of Vietnam. Their number is estimated at approximately 1.7 million. They were about 500 AD. al in Vietnam. This group is divided into smaller groups (eg Ngan, Phen, Tho, Do Lao, Pa Di). The Tay primarily inhabit the area in the north-eastern part of northern Vietnam. The Tay have a very rich culture. Starting with the traditional folklore: wedding songs, poems, dance and music. The most famous song is called "Hat Luon". It is a duet between lovers. During the year there are a number of festivals and celebrations, which have different meanings. Tay are mostly farmers and some traditions continue to exist until now. E.g. the cultivation of wet rice, dig irrigation canals, threshing grain rice on wooden racks (Loong). The most famous craft of Tay minority weaving brocade for original design. Which are highly appreciated. The clothes are not as colourful as other ethnic minorities. The dress is made of cotton, which they paint indigo-blue. There is not much embroidery to see, or other decorations. The women wear skirts or pants, polo shirt and black scarf, men wear pants and shirt or T-shirt. Don Lao minorities wear cone-shaped shawls on their heads and Tho minorities wear dresses, like the Thai of Mai Chau. The houses are similar to those of the Thai. They are built on stilts. For the construction of the roof one uses poles, straw or palm leaves and the walls they use wood or bamboo. The villages are often built on the foothills of the mountains. The names of the villages are often named after the mountains, rivers or fields, where they live. Villages are often large and have dozens of houses. The Thai is the 2nd largest minority in Vietnam after the Tay. They are approximately with 1.5 million people. Residents of this minority lives mainly in Son La, Mai Chau, Lao Cai and Lai Chau. In the area of Lai Chau and Lao Cai live in the north of the White Thai in the north. In the southern part of the province of Son La, Yen Bai Mai Chau live the Black Thai. But you'll meet also White Thai in Mai Chau. They wear special clothes for cultural performances. The Thai people are known for its beautiful woven clothing, accessories and their typical houses on stilts. These homes are designed to protect them from possible flooding and dangerous animals. They also provide shelter for their animals. The women have retained their traditional dress, while men usually dress like the Vietnamese (not everywhere). The Black Thai women wear blouses (green, blue, pink, purple) buttons with a distinctive row, black skirt, black scarf, white scarf (in White Thai women). The Thai people have a wealth of legends, myths and ancient legends. The Hmong are one of the largest minorities in Vietnam (about 1 million people). 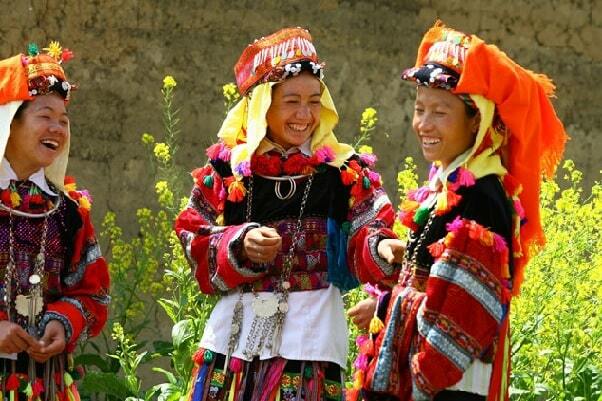 They live mainly in the mountainous region near the Chinese border. There are several ethnic subgroups and they can be easily identified by their clothing, which they must wear conform their tradition. Black Hmong are known for their handicraft and their traditional indigo blue clothing. 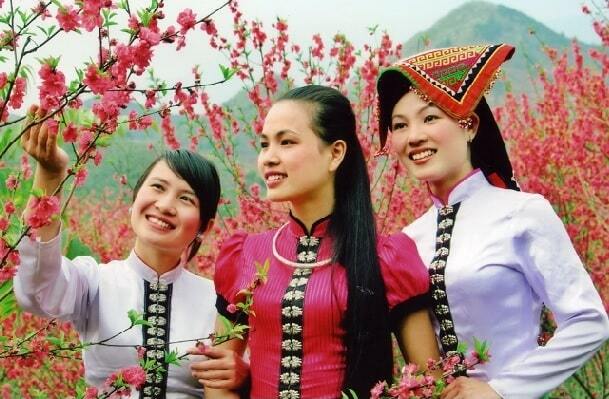 The Flower Hmong wear expressive, colourful clothes. It is not difficult to recognize them at markets in Bac Ha and Coc Ly Lao Cai. The other subgroups of Hmong are White Hmong, Red Hmong, Green Hmong and Chinese Hmong. The Hmong came about 300 years ago to Vietnam from South China, during the reign of the Ming and Qing dynasties. Their departure was because they were against the Chinese imperialism of these dynasties. 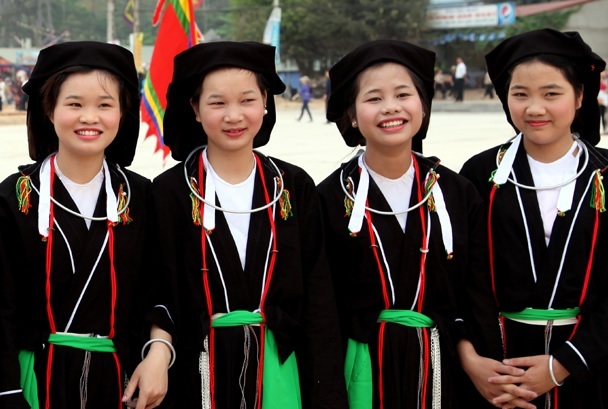 A large number of Black Hmong can only be found in Sapa and Lao Cai province. The duty of man is to take care of the whole family. He takes important decisions about the safety and welfare of the family. He is also seen as the main breadwinner. His wife must be above all a good housewife, taking care of the children and preparing the food. Part of the work of the women consists of making handmade traditional clothing or jewellery. For making clothes they use hemp and indigo colour. The Hmong use traditional methods for colouring and decorating - batik. Hmong are very skilled in making clothes and the cultivation hemp for making clothes. The situation is slowly changing with the arrival of tourists in Vietnam. Many Hmong in Vietnam have lost many of their customs and traditions. They adapt to the new customs and culture. The clothing changes, they start a business and ride a motorcycle. The Hmong live mainly in the north of Vietnam and there you can still see their simple and difficult life in the beautiful nature. Dao speak the same language as the Hmong. You'll find them in the north of Vietnam and along the border with Laos. There are about 600,000 Dao in Vietnam. The history of the Dao is not fully known. They came from China. They came between the 12th and 13th century and the early 20th century to Vietnam. Women in this group are easily identified by their triangular red turban / scarf decorated with silver coins and red tassels. Men usually wear long trousers with a shirt and a scarf on the head. Family rolls is similar to the Hmong. A man has a dominant role in the family and it is also an important economic factor. The woman takes care of the household, the children and related activities on her behalf. Very important is the choice of the place where the family will live. It is customary to put down a bowl of rice for the whole night. It represents the richness of the area, the number of cows, buffaloes, money and good. They chase after their dreams and when no more rice could be cultivated there, move on to another place. The Red Dao mainly live in Cao Bang, Lang Son, Tuyen Quang, Ha Giang and Lao Cai. Nowadays the village of Ta Phin has more than 700 Red Dao.